Written by Georg Holzmann on Feb. 19, 2014 in News. 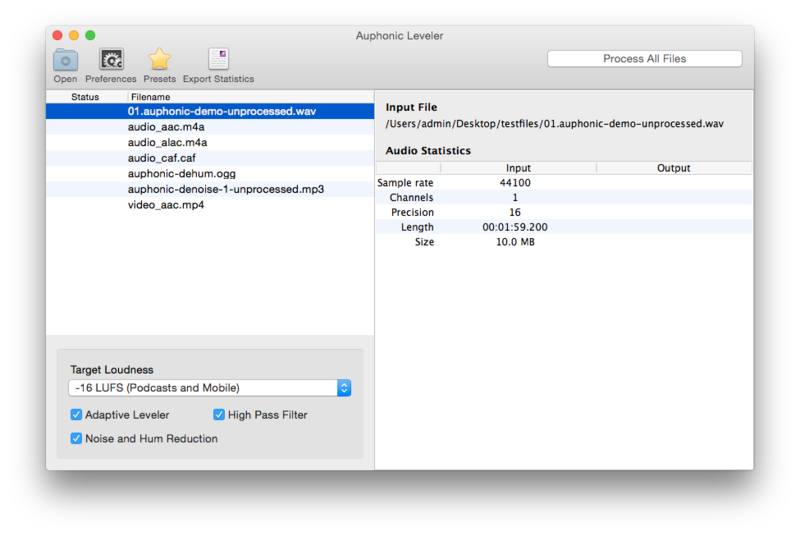 Last week we proudly released the Auphonic Leveler Batch Processor for Mac OS X 10.6+ (64 bit). This is the first desktop version of Auphonic audio algorithms and also the first commercial Auphonic application. After valuable user feedback we added a trial version, AAC encoding and MP3 encoding to the Auphonic Leveler 1.1 today! The Auphonic Leveler is an intelligent Desktop Batch Audio File Processor which analyzes your audio and corrects level differences between speakers, between music and speech and between multiple audio files to achieve a balanced overall loudness. It includes a True Peak Limiter and targets for common Loudness Standards (EBU R128, ATSC A/85, Podcasts, Mobile, etc.). The algorithms of the Auphonic Leveler Batch Processor are exactly the same as implemented in our web service. They include more detailed audio algorithm options and will be computed offline on your desktop computer without the need to upload and download files. 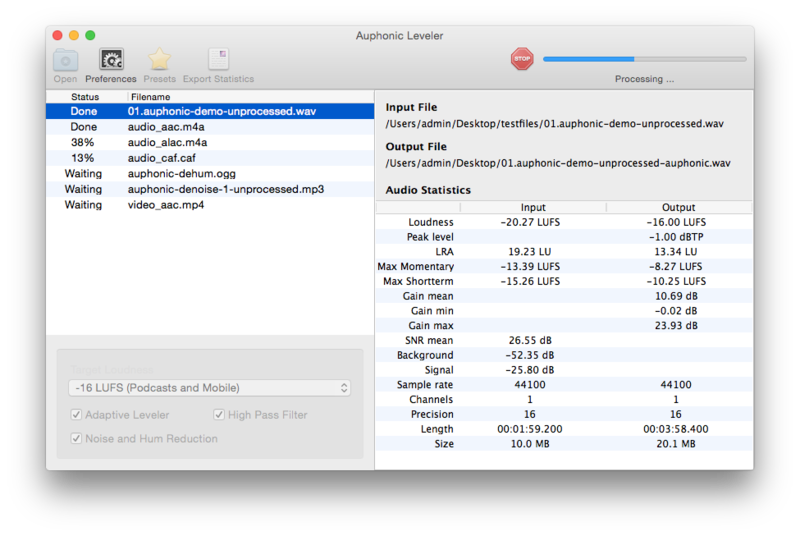 The screenshot above shows the Auphonic Leveler with multiple files. The Audio Algorithms Box (bottom left) lists basic controls to enable/disable the Adaptive Leveler or High Pass Filter and to select a Target Loudness level. After processing, detailed audio statistics are displayed in the right table (see screenshot below). Detailed information about all features, licensing options, pricing and a trial version can be found at the Auphonic Leveler Batch Processor Page! Please let us know if you have any special feature requests or questions and enjoy the first Auphonic desktop program!